Transition in the US is emerging in all kinds of places. The upbeat optimism and positive spirit are proving to be a good catalyst and groups of all sizes are igniting newsworthy activities. These have attracted attention from some pretty big media sources (Elle magazine, Christian Science Monitor, New York Times Magazine, Time magazine, USA Today, plus a score of local papers). As Transition in your area hits the news, please share your news articles with us. 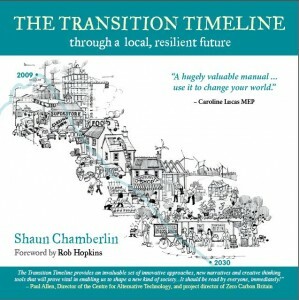 We are also happy to announce that Rob Hopkins, originator of the Transition Town concept, co-founder of the Transition Network and author of The Transition Handbook, is now a Post Carbon Fellow! This month we've been busy getting ready for the launch of the new transitionus.org website which will be live in mid-April. Since our last newsletter, a month ago, we have had six Transition trainings across the country and the list of Official Transition Initiatives continues to grow. Training for Transition courses have been successful with many trainings full to capacity and waitlists brimming with eager participants. Working in pairs, our pool of twenty-one US Trainers are busy making arrangements and are looking forward to sharing their knowledge and expertise with communities across the country. If you're interested in learning more about what it takes to host a Training course, contact us. This month, we welcome six new Official Transition Initiatives in the US, bringing the total to twenty-one: Los Angeles, CA, Denver, CO, Whatcom, WA, Mount Shasta, CA, NE Seattle, WA, Louisville, CO and Newburyport, MA. Transition Initiatives are hosting all kinds of working group meetings, events, film screenings, bicycle tours, re-skilling workshops, trainings and going through tasks from writing press releases to drafting their core principles. Learn more about the first steps to Transition. Sustainble NE Seattle is 19th officially recognized Transition Initiative in the U.S. They have actively formed several 'guilds', including the Urban Farmers guild, a working group of Sustainable NE Seattle interested in sharing knowledge and resources, and providing opportunities to share the bounty of what is grown in their neighborhood. Since the Fall, they've hosted work parties to transform front lawns into food producing gardens. Watch the video of how it all began. "We've sponsored two Edible Garden Tours so far. Another group is the Awareness Group, which organizes movie showings. Local Motion is the guild that is concerned with promoting bicycle riding, bus usage, and other issues related to transportation. We are also co-sponsoring a 2-day Training for Transition in Seattle," says Leo Brodie. 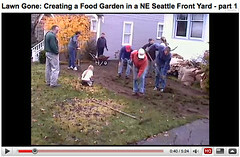 Visit Sustainable NE Seattle online at http://sustainableneseattle.ning.com. On Saturday, January 31st, Transition Santa Cruz held the first of what they expect to be many inspiring community workshops using the "Open Space" approach. "The topic of the day was the Future of Local Food, or, "How will we feed ourselves in the decades to come?" About 50 community members showed up at United Methodist Church, rarin' to sink their minds into the topic together (and their teeth into the delightful organic lunch we provided)." Read more. A new and improved website at www.transitionus.org is on its way and will feature resources and information to help groups involved in Transition. Look for it in mid-April. 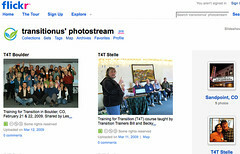 Transition US is on flickr! We've created a new flickr photostream for gathering photos. Join the group pool and post your photos, or browse the dynamic map of photos. 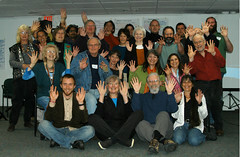 Thanks to some avid photographers, we now have photos from Trainings and events in Stelle, Ann Arbor, Portland and more. Are you a muller? As part of the new site, we're gathering contact info for all those folks who have read the primer and are "mulling over" how and whether they will form an initiative their locale. If you are a muller, we want to hear from you and help connect mullers in communities across the US and support their efforts. What this book strives to do is not to set out a complete guide to creating an Energy Descent Action Plan (which will be a subsequent publication), but rather to present the context for these local plans. It arose from various Transition initiatives telling us that they found it hard to start thinking about how to design for the future evolution of their community over 20 years, as when they tried to look forward, it all looked rather foggy. So that's what Shaun Chamberlin has done so brilliantly here, to set out as clearly and eloquently as possible what that collective journey might look like. Read more. Chelsea Green has an offer for Transition groups: 45% discount on 20 books, and 50% on 50 unless you're set up as a reseller, in which case you get wholesale terms (Place an order for Transition Timeline Paperback online).